…This cake is a bit easier to make but still pretty impressive. I used a few short cuts and tricks, and I was really happy with the end result. You will need to make a hole in each profiterole – I used the tip of a piping bag (it was easier to prepare both bags of profiteroles at the same time to form a bit of a production line). Lightly dip the base of each profiterole into the chocolate and place on top of the profiteroles – working your way around and up in the shape of a cone. This last chocolate step is important as it makes the cake quite secure so the profiteroles and strawberries don’t fall. Once you have made the cake pop it in the fridge to set the chocolate and mousse. I had a friend come over to my place to help with the multiple processes. It took a few hours to complete but was definitely worth the effort. 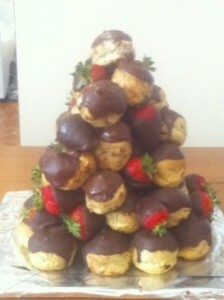 Some of the comments were ‘this is the best profiterole cake I have ever had’. Overall this was a huge success! Planning is really important. I did as much prep work as I could beforehand: breaking the chocolate, making sure all utensils were clean and ready, having an empty kitchen and clean fridge all helps as this is a time consuming cake to make.